Michael Lebo is a 2010 C/3B with a 5'9'', 165 lb. frame from Mechanicsburg, PA who attends East Pennsboro HS. He has a strong, compact frame for his age. 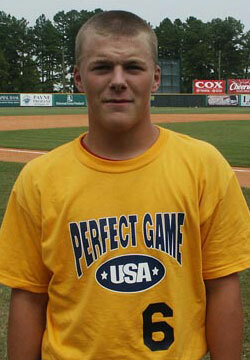 Lebo is a left handed hitter, always a big plus for a catcher, and showed prospect level tools with the bat. His strength and short levers keep his swing short and quick and Lebo had very good rhythm and balance in his swing through contact. He hit good pitching hard during the games and swung the bat with confidence. He tends to cut himself off short out front, which affects his power, but he's young and can grow through that. Defensively, Lebo has nice arm strength for a 2010 prospect at 73 mph during drills and will be able to quicken his release times through some fundamental adjustments. 2.09 is quick for a 2010, though. Lebo has good blocking technique and energy and kept balls in front of him well. He's a solid young catching prospect with the tools to play at the next level on both sides of the ball. Lebo is also a good student. He was named to the Showcase Top Prospect Team.